Made these for breakfast. My husband loved them! I had no trouble with the crepes breaking. I also added vanilla, and added some powdered sugar to the batter after the first one (to make the crepes crispier). To be honest, I found the crepes’ texture a little off. Too dense, not chewy enough. I’m going to experiment with different flour blends and try altering the proportions. i also substituted a self-made mix of gf flours: quinoa, amaranth, corn and rice. i also needed to add more liquid: 2.5 cups. and yes, my kids (14 and 15, 2 girls and a boy, 1 vegetarian and 2 carnivores, none gluten-sensitive like me) love them!! they sometimes even take them to school as wraps! My daughter loved these. Thanks for the easy recipe. We added vanilla to make them a little more flavorful. I’m so glad that your daughter loved it. Adding vanilla is such a brilliant idea! Thanks Elise for sharing your experience with us! My mother inlaw loved them and I didn’t have enough milk so I used some soy milk as well. Turned out great. No trouble flipping and batter was smooth and not too thick. Hi Katerina! Glad your mother in law loved it. Thanks for letting us know that soy milk works fine too. Just made these. So happy that they were SO easy and quick. They turned out beautifully. I followed the recipe exactly, and they weren’t too thick like some reviewers complained about. I used brown rice flour that we ground ourselves. My kids loved these too. (I also happened to use goat milk and farm fresh eggs because we are lucky to have friends nearby that sell that to us, but I still think it would have turned out just as good with cow’s milk and store bought eggs). I think people who have trouble flipping them and having them fall apart could either be flipping too soon or don’t have a good non-stick pan. These held together really well for me. Thanks! Hi Em! I’m sooo happy to hear that the recipe turned out well for you. 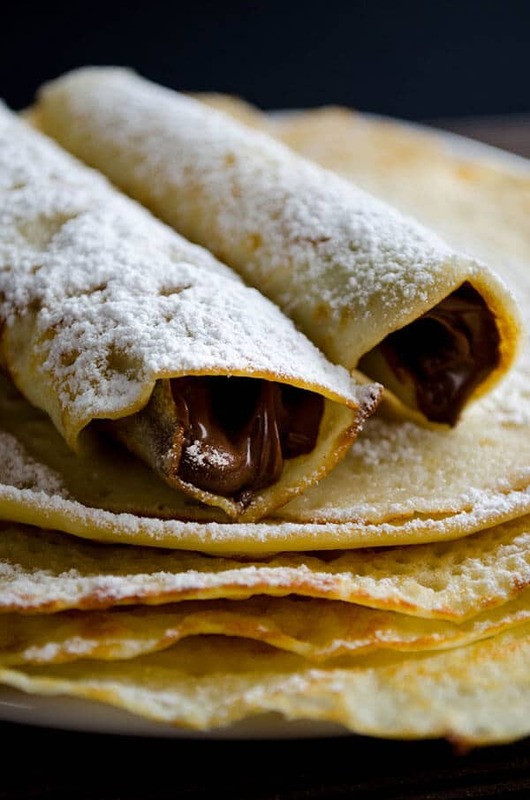 I think a recipe is successful when approved by kids, so thank you for letting us know that your kids love the crepes too. You are so lucky to use goat milk and farm fresh eggs. I’m sure they make the crepes even tastier. Thanks again for sharing your thoughts and experience with the recipe here! I just made these and they came out great! I used quinoa flour since that is what I had on hand and subbed the regular milk for almond milk. I’m glad you liked it Saskia! Quinoa flour and almond milk sound like great substitutions. 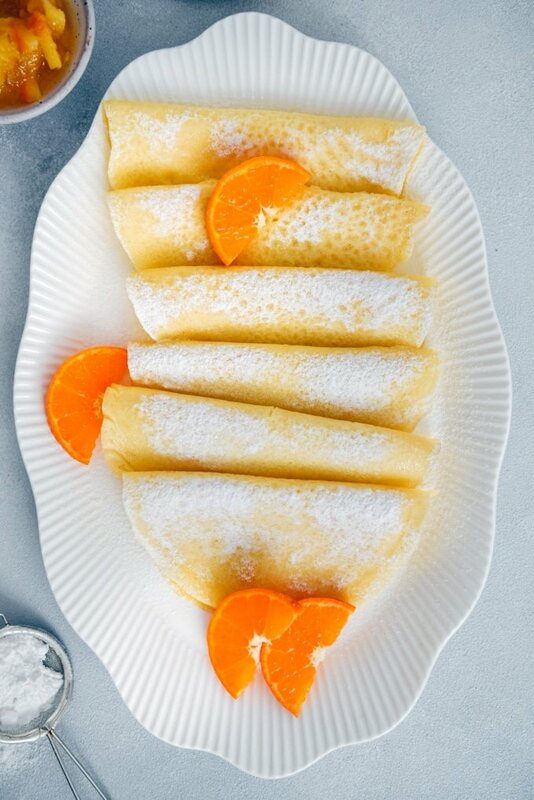 These crepes look gorgeous. 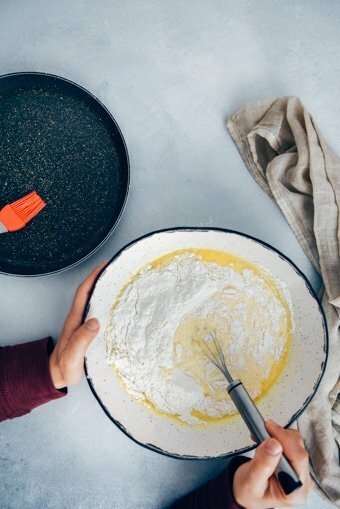 I’ve always made these with flour, would be interesting to try a healthier gluten free version. These turned out terrible for me. My daughter was just diagnosed with Celiac and I promised I’d make her GF crepes this morning since they were her favorite before her diagnoses. The batter turned out too thick and the whole idea of olive oil did not help it spread out in the pan. When I went to flip the first two, they crumbled a part and made a mess. I ended up with crepe crumbles under the stove grate which added to the disaster. I tried adding a tad bit of xanthan gum to bind the batter and planned to try making just pancakes instead. That didn’t work either. Eventually I put the batter in my waffle iron. My waffle iron had never failed me until today. My seven year old daughter was crying because she couldn’t have her favorite food and she blamed it on the celiac. I was late for work. I had a pile of dishes, a plateful of crepes, pancakes, and waffles to compost and nothing for breakfast. On top of it all today is my grocery shopping day so the only other thing I had in the house was lettuce from last night’s salad, some smoked salmon, and some GF cookies. I’m dissapointed that after and hour and a half of attempting to work with this recipe, both my daughter and I had to resort to cookies and salad for breakfast. Did I mention the fire alarm went off because of how much smoke the oil caused when my crepe fell under the stove grate? All together it was a horrible day and this recipe was the beginning of it all. I’m glad that, based on the comments, it at least worked out for some of you. I ended up just wasting expensive ingredients and disappointing my already bummed out daughter who thinks nothing tastes good GF. But again, I’m glad it worked out for some of you. Hi Katia! I’m really sorry that the recipe didn’t work for you. You described it so well that I can picture what you experienced and I can understand how you felt. However, I’m not sure what caused all these. The recipe has never failed for me. I’m planning to make a video of it soon. Hopefully it helps for everyone. Just made this and I’m so impressed. I’ve tried doing gluten free crepes before and it was a flop. I just couldn’t get them thin enough. But these are gorgeous! Not only that, but it was very quick and easy. Exactly the brunch recipe I was looking for today! Thank you! Great to hear that Rachel! Thank you so much for sharing your thoughts here. Enjoy your brunch! Thanks! I found I had to add 3 cups of milk, it was too thick for me otherwise and I couldn’t get the crepes thin enough, but this is more likely due to my cooking non-skills. Hello!!!! Can I make the creeps with coconut flour? Hi Salome! Is coconut flour the same with shredded coconut? I’m not sure but the batter might not hold together. I’d love to hear what you experience if you try it. I had left overs that I popped in the fridge. The next day when they were a little hard from the fridge, I stuck them on my flat iron toaster, one at a time. Crisped them up and they made the most delicious thin, crispy crackers. I topped with hummus and cherry tomatoes and cut into pizza slices. My kids devoured them, and we will be using them for a wheat free alternative to pizza bases. Thanks for the super recipe! Wow! That’s a great idea to make crackers from the letovers. Thanks for sharing it here Briony! Been making these for years.I use homemade sprouted brown rice flour.They come out great.I usually fill them with fruits (my kids’s favorite is banana and strawberries sauteed in a bit of coconut oil with a pinch of cinnamon and topped with fresh whipped cream) and homemade chocolate hazelnut spread (not-tella). Hi Ann! It would be great to fill them with fruits. Thanks for the filling recipe you share with us here. Sounds amazing! I’ll try it that way next time. Never tried freezing them. But I’d love to hear the result if you try. Thank you for your inspiration! I made these and shared with my blog readers today! PS: I used almond milk and found I needed to add an additional 1/4 cup to get the batter thinner and the right consistency. I used Bob Mills Rice Flour and found no problems as some have stated above. They were filled with homemade Blackberry Chia Jam and Coconut Cream. It’s like dessert for breakfast! Great to hear that you loved it! And thank you for sharing your experience with us here. Filling it with blackberry Chia Jam is a super idea! Will have to check out your blog to see if you have the recipe for the jam. I made these today on a lazy Sunday. They turned out great. I cooked them on my cast iron griddle (Lodge brand,can be had for 15 bucks on Amazon) I do think having the proper pan goes a long way to making them awesome. I may thin the batter out a little bit next time but still, these were delicious. Thanks for the recipe! Love these! 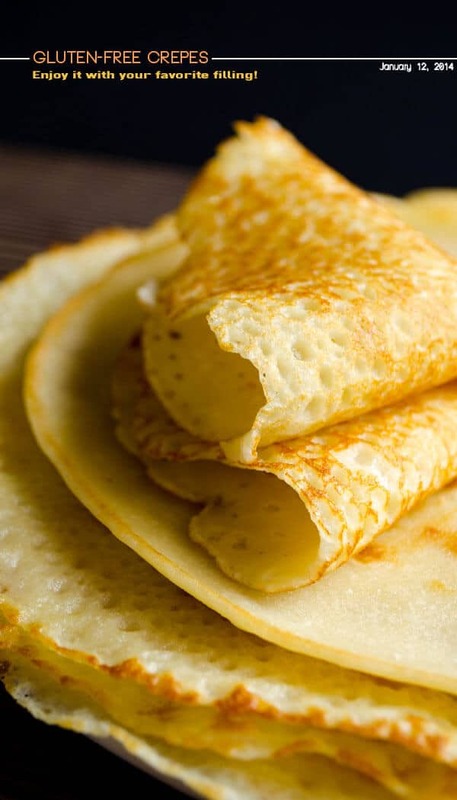 My five-year-old asked for crepes this morning and, because my wife is cutting wheat from her diet, I needed a new recipe. This is my new crepe recipe, period. I added half a cup of sugar, since the kids like sweet crepes, and a dash of vanilla extract. I rolled a banana in a crepe, topped it with crushed pineapple and fresh made whipped cream. Yum! Thank you for this recipe. I had the crepe with apple sauce. His name is Shiloh.Is their any other recipe that i can use? He is five years old. He LOVES them. 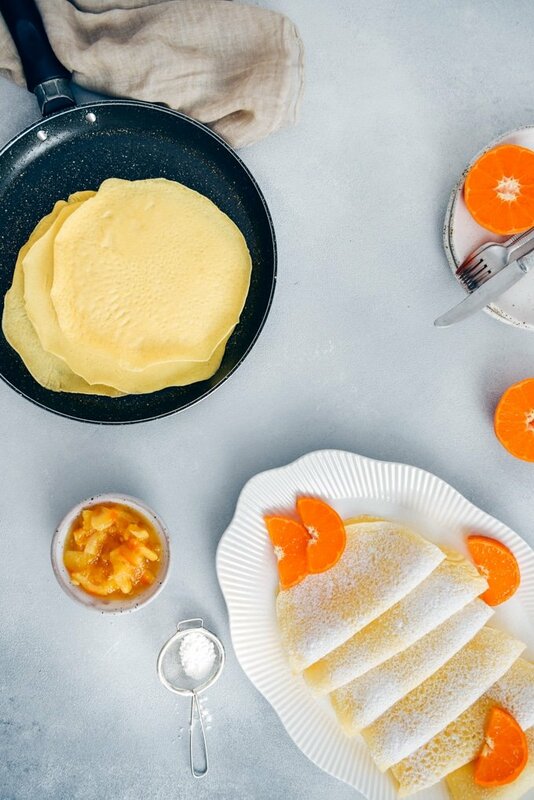 This is by far the best non-gluten crepe recipe I’ve tried! I used 1 cup brown rice flour (from Whole Foods bulk section), 1/2 cup creamy almond milk, 3/4 cup water, pinch of salt. 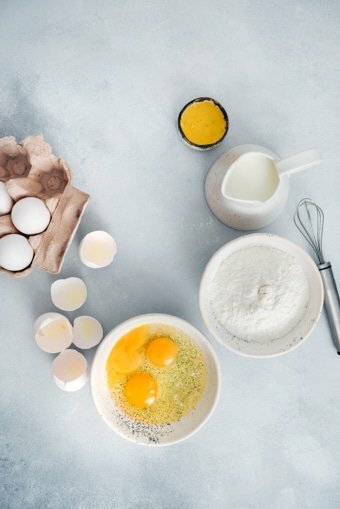 Batter consistency should be that of a runny milkshake. Skillet needs to be hot (medium-high). Before pouring the batter, I’d pour just a touch of olive oil into the skillet. 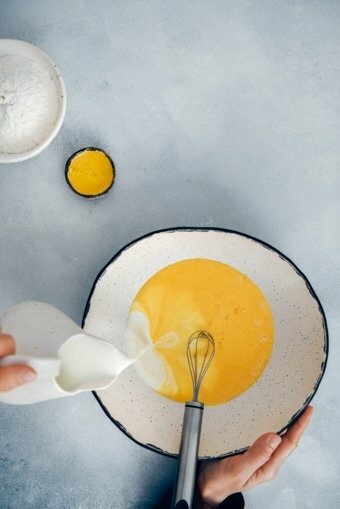 Also, before pouring the batter, I’d thoroughly re-whisk the batter since the flour had a tendency to settle. 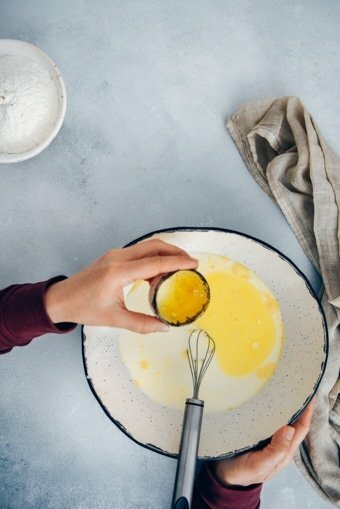 Then, I’d ladle just enough batter to cover with skillet (with the skillet off the fire and just tilting it around until the batter covers the surface.) The crepe should be as thin as possible. 1-2 minutes for it to set and brown on one side (bubbles to form), flip, then 1 minute to set on the other side. Any longer and the crepe will fry and will not be soft. Stack them on a plate, stacking as you go and then flip so the bottom is the top one when you’re ready to serve. The heat will help keep them soft. I had no problem with rolling them up. The taste was very neutral, not sweet not salty. If I was using a sweet filing, I’d add some honey and vanilla. Although, frankly, I didn’t find it necessary. 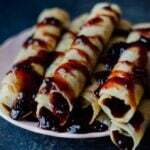 The best recipe of gluten free crepes! I added vanilla extract and a bit of sugar and they were fantastic. Hi Ania, I’m so happy to hear that you loved the recipe. Vanilla extract sounds like a great addition!